Our Spacious Sun Deck is ideal for an outdoor reception or cocktail hour of 50 guests or less and features panoramic views of the Gulf of Mexico. A rental fee for the use of the Sun Deck is $500. Rental Hours for The Sun Deck are until 10 pm. This fee includes the use of 5 High-top Cocktail Tables with Linens. *Additional Decor, Tables, Chairs, Table Linens, Chair Covers and any other services other then what is listed in the above paragraph are available for an additional fee and must be selected separately. All fees are based on a four hour function. Any function exceeding four hours will be charged an additional service fee of $100 dollars per hour. If you would like to extend your time to over 4 hours, please mention that to your Coordinator. In addition to the rental fee, a cleaning fee of $150 and an onsite reception director fee of $125 will be added to the rental price for all events held in the Event Room. Management must approve all entertainment for functions. No music with explicit language is permitted. The client will be responsible for issuing a list of all entertainers and phone numbers. Due to noise ordinances, all music must end at 10pm. Management reserves the right to require lowering the volume if it exceeds acceptable levels. Very Important: Management must approve any Décor or Equipment provided by the Client or outside Vendor. A full list of any outside items you wish to provide must be sent in writing to your Coordinator for approval. 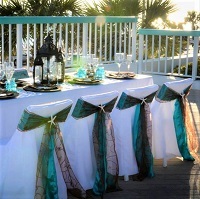 All Decor provided by Clients or outside Vendors must be set up and broken down by the Client or outside Vendor. Island Sands Beach Weddings and Royal Palm Grille Staff will not be responsible for setting up or breaking down these items unless special arrangements have been made. Please discuss your plans with your Wedding Coordinator well in advance to ensure your event runs smooth. Failure to do so may result in not being allowed to use the items you bring with you. Special arrangements must be made to schedule and gain access to the Beach for set up.